(CNN) — First lady Michelle Obama is in China for an official visit to expand Sino-American relations, but she will refrain from talking about political differences. Mrs. Obama, who flew Wednesday from Washington, D.C., is making a week-long trip to three Chinese cities and will speak with children at several schools about the importance of education and youth empowerment. The U.S. first lady has several activities and events scheduled Friday with Chinese first lady Peng Liyuan. “Her visit and her agenda sends a message that the relationship between the United States and China is not just between leaders, it’s a relationship between peoples,” said Deputy National Security Adviser Ben Rhodes. President Barack Obama is expected to meet with Chinese President Xi Jinping next week during the Nuclear Security Summit at The Hague. White House officials told reporters on a conference call that issues on which the U.S. and China differ, such as human rights and trade, will be discussed directly between the two leaders and other representatives of the governments. “We don’t expect the people of China to agree with all of our policy positions at any given moment, but the more they understand the United States, the more they understand the President and the first lady and their values and their priorities, we think the better it is for both of our countries,” Rhodes added. Mrs. Obama plans to visit the cities of Beijing and Chengdu, where she will speak to students and discuss cultural exchanges and the benefits of studying abroad. China is the fifth most popular country for American students studying abroad, and more students from China study in the United States than from any other country. Beyond her message on education, Mrs. Obama will join Madame Peng in a tour of the Forbidden City and the Great Wall. Mrs. Obama will then travel to Xi’an to see the Terra Cotta Warriors. In Chengdu, she will tour the Chengdu Panda Base, which houses approximately 50 pandas. 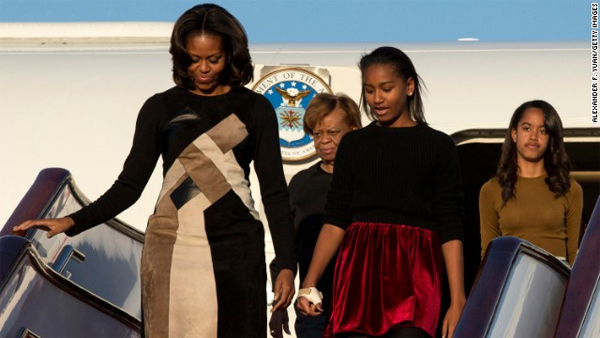 The first lady will be accompanied by her mother, Marian Robinson, and her daughters, Malia and Sasha, something that White House officials believe will resonate with the Chinese people. “I think they understand the significance as well of family and of three generations of family traveling together, which I think the Chinese will appreciate, and will appreciate the ties and the bonds that the Obama family have with one another across generations,” said the first lady’s chief of staff, Tina Tchen.